So back when I got this new job in Baltimore in January but wasn’t moving until August, I got itchy about my new town, and that lead to some joining of historical societies and purchasing of season subscriptions to the Baltimore Symphony Orchestra. And now I live in Baltimore, and tonight it turned out I had a ticket to the orchestra. I put on a dress and some heels, strapped on a purse with my slow moving vehicle belt, and zipped down the hill to Meyerhoff Hall. I locked up to a sign and headed in, got a glass of wine, and found my seat. I don’t know anything at all about classical music, so I sat there and listened and thought about a zillion different things, like, the flutes were good, I liked the quiet, sneaky way the cellos kept starting stuff, the conductor‘s body was the music, especially when she’d stir things around or bring everybody up and then point and pull and make it ripple. I also thought about the guy in front of me in this picture, who leaned up against the railing and blocked the view for the rest of us, and the couple in the special box down to the right who were napping, and the third french horn–great haircut. I wonder what everybody else was thinking about. I loved it, teared up a couple times, and enthusiastically engaged in the endless standing ovation. And then I unlocked my bike and pedaled home. I like my season tickets, and I’m glad I didn’t have to get season tickets for parking–yes, they really have those. Can I have a bike rack, please? I am going to be using it. 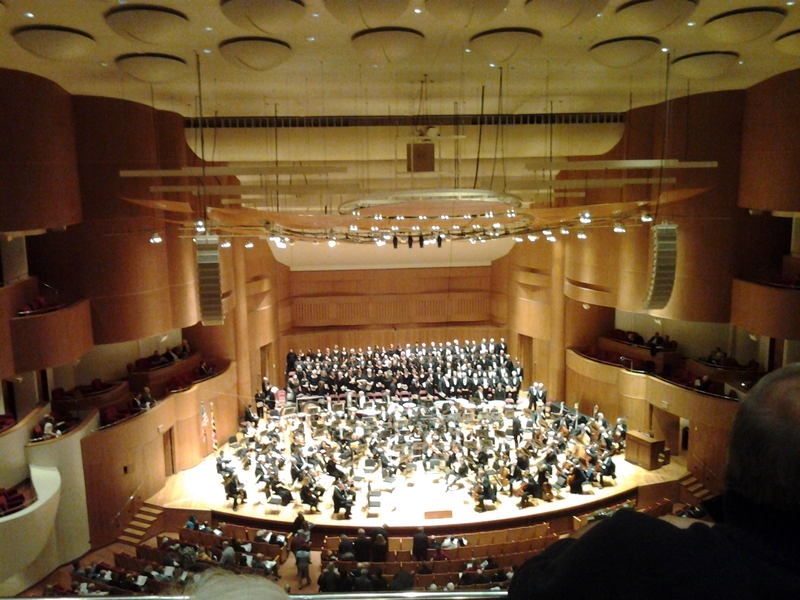 This entry was posted in music and tagged Baltimore, Baltimore Symphony Orchestra, Joseph Myerhoff Hall, Marin Alsop, Mt. Vernon. Bookmark the permalink. I love this post. Can we go when I visit. I would love that! I am going to ask a stupid question here…has been nagging me for a bit. How is it possible to mount/dismount and pedal straddling a bar (as in a man’s bike)? I am glad you enjoyed the Symphony; Orchestra music is the best. I’m also happy that you seem to be settling with ease in your new place of residence. I look forward to many blogs from your new city. Hi, Denise! Do you mean, how is it possible in a skirt? Welllll….excellent question. I just make sure my skirt is tucked under me and I keep it pushed down over my legs. Also, I have no shame. 🙂 Hope all is well with you!